There are many variations on Spanish Coffee, but the most famous style of Spanish Coffee is also the most dramatic. Also known as "Flaming Spanish Coffee," it is lit on fire during its preparation. 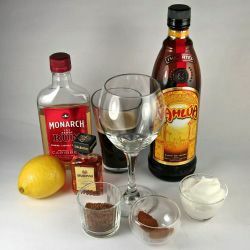 This step-by-step guide to Flaming Spanish Coffee includes instructions for several variations on the theme, including alternate liqueurs and toppings. Using the sugar and the lemon juice (or a liqueur), rim a wine glass, Irish coffee mug or ​another piece of sturdy, stemmed glassware. To rim the glass, you'll need two shallow bowls or small plates, each with a larger diameter than the rim of the glass. Put the lemon juice in one bowl (or on one plate) and the sugar in/on the other. Dip the rim of the glass into the lemon juice and then, while it is still wet, dip it into the sugar. The sugar will stick to the rim of the glass. Keep a fire extinguisher nearby. If you've never made a flaming cocktail before, please don't skip this step! Move any highly flammable objects away from the area in which you'll light the cocktail. Prepare your spices by either unscrewing the caps of their canisters (preferably with a perforated lid for dusting spices over the drink) or by placing them in a small bowl. Remove the screw tops from you liqueurs and place them nearby, but in a spot where they won't tip over while your drink is on fire. Move your brewed coffee to a spot near the glass. Pour the 151-proof rum into the wine glass. Roll up your sleeves and (if necessary) tie back your hair. OK, now you're ready to light the drink on fire! This part is a little tricky, so take a deep breath and keep your cool. Tilt the glass at a ​45-degree angle. With a long match or lighter, light the rum on fire. Don't be startled if it lights on fire before the fire touches the rum—this is normal. Return the glass to its vertical position and place it on a flat surface. If you used a match to light the fire, blow the match out. With your hand flat and facing down toward the table, hold the stem of the glass firmly between your index and middle fingers. Moving your hand in a circular motion, swirl the flaming rum in the glass to caramelize the sugar. Quickly and carefully pour the desired liqueurs and/or liquors on top of the cocktail. (Do not pour from too high or the flaming rum may splash out of the glass.) Do not worry if the liquid is boiling at first. It will cool down as you add more ingredients. Once you have added the liqueurs/liquors and coffee, the glass should be 2/3 full or fuller. Once you've topped your drink, it's ready to enjoy. Just be careful—it's probably still very hot!